Our boys are our very own loved house pets and sporting companions, they are our 'children', and we strive to provide the very best care. In addition to being at stud, our boys are our family companions **We never place adults, these boys are our own pets, and when their career in conformation showing and at stud is complete, they continue their careers as our active family companions. We are a bit picture crazy, we love our AHTs and take photos all the time. We had so many pictures of our own AHT boys that we decided to put them up in online albums! Check out hundreds of our American Hairless Terrier pictures on our Valley AHTs Imageevent and ValleyAHTs Flickr sites! Guess who? It's a baby Scooby! This is SDK's Scooby McGurk at the age of 16 weeks! 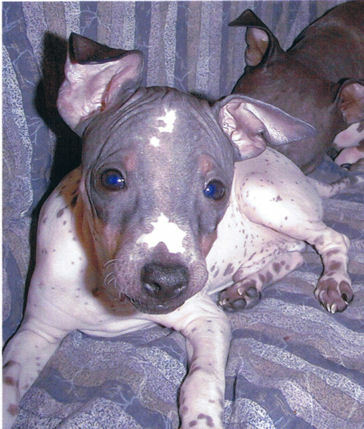 This site is © Copyright Valley American Hairless Terriers 1999-2009, All Rights Reserved.